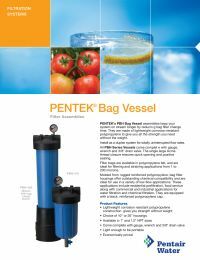 Pentek PBH-420-1 bag vessel assemblies reduce bag filter change time which minimizes down time for your system. They are made of corrosion resistant polypropylene so they give you all the strength you need without the weight. Pentek 150367 bag filter housings come complete with pressure gauge, wrench, filter basket and 3/8" drain valve.